Crony Chauffeur are one of the leading chauffeur services providers across London United Kingdom, offering professional and realizable, finest chauffeur. 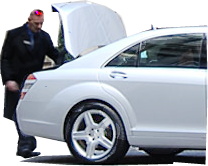 All our vehicles are fully air-conditioned, clean and chauffeur driven, ensuring a relaxed and carefree journey. Whether your journey is from airport to hotel or from office to meeting venue. All fitted with latest Satellite Navigation and tracking system GPS ensuring your safety during the travels, comfort without guarding the driver and reach on time to your destination. We meet passengers from all over the world, some of who travel for the first time to UK and others who make frequent visits on business or holiday purposes. Personal Meet and Greet Service at the terminal. Allow us to transport you in style, comfort and safety in one of our chauffeur-driven Luxury licensed vehicles to anywhere you need to go Inner/Outer London, United Kingdom.